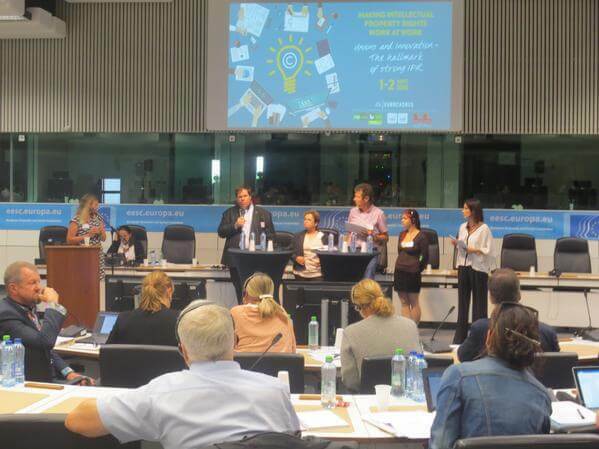 “IPR are not an obstacle for mobility”, declared business representative Dominique Kaesmacher at a conference in Brussels on 1 and 2 September organised by Eurocadres in cooperation with its Belgian affiliates. The event brought together a wide range of stakeholders to discuss the role of unions in protecting intellectual property rights (IPR) of employees: inventors, researchers, lawyers, scientists, journalists, social partners, MEPs… Mila Nikolova attended the conference as ETF representative. Two main views were outlined during the discussions: there is room for improvement in terms of collective bargaining, especially at company level, to ensure all relevant specificities are being taken into account in this extremely delicate balance of interest and merits, as well as the need to improve the legislative framework and install harmonisation at EU and global level with regard to the mobility of professionals. The conference is one in a series of events organised to discuss interrelated topics addressed by the Council of Professional and Managerial staff (P&MS). Eurocadres President Martin Jefflen presented to the General Assembly the council’s intensive work on trade secrets, new skills agenda and the Blue Card revision, whistle-blower protection etc. Coming next: a conference on digitalisation in Paris in October and, if approved, a project on psychosocial risks for P&MS with gender desegregated data. More information is available on the Eurocadres website.